Our Lady's Prophetic Message for Our Times! 400 years ago, the Blessed Virgin appeared to Mother Mariana de Jesus Torres, in Quito, Ecuador. She commissioned a life-sized statue of herself holding the Infant Jesus under the title "Our Lady of Good Success" and made many startlingly accurate prophecies about the worldwide crisis of faith and morals that would begin in the 19th and 20th centuries- and continue to our days. Approved by the Church since 1611, Our Lady predicted this amazing devotion would not be widely known until our times. Also, she linked the spread of this devotion in our days to her miraculout intervention for the restoration of the Catholic Church, precisely "when almost all would seem lost and paralyzed." Shot on location in Los Angeles and Quito, Ecuador, this all-new documentary features exclusive interviews with accepted authorities on Our Lady of Good Success. Plus, never before seen footage shot inside the cloister of the convent where it all took place. 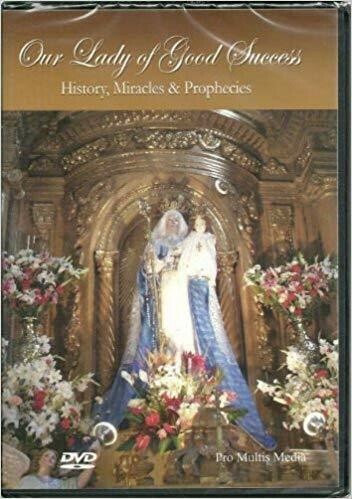 In this inspiring DVD: Our Lady's prophecies for our times; The miraculous completeion of the Statue; Miracles of Our Lady of Good Success; The Inspiring "Rosary of the Dawn; Our Lady's promise of restoration; and much more. 50 minutes in length.